Figure 1: (left) Electron micrograph of a submicrometer-sized ZnO spherical particle film and a schematic diagram of a proposed random laser element. (right) Emission spectra measured at a defect. AIST researchers have demonstrated that when optical defect particles are introduced into a thin film made of homogenized zinc oxide (ZnO) particles obtained by the submicrometer-sized spherical particle production method (laser-induced melting method), the film functions as a random laser with superior lasing properties (Fig. 1). Random lasers have gained attention as laser elements that can be inexpensively and easily manufactured without the need for clear cavity structures that require high-level material synthesis and processing technologies. A wide variety of applications can be expected for the developed small random laser elements utilizing submicrometer-sized ZnO spherical particles. The applications include small light sources, spectroscopic devices for household health monitors, illumination materials, and electric devices that require light-emitting elements, etc., that are required to be inexpensive and to have monochromatic properties. Details of this technology will be published in a U.S. scientific journal, Applied Physics Letters Vol. 102, No. 6 on February 13, 2013. Lasers are expected as light sources that contribute to the basic technology of many industries, such as processing/manufacturing, information/communication, medicine, horticulture, and energy. However, conventional laser elements require a clear cavity structure for causing laser oscillation, and such a structure requires high-level material synthesis and processing technologies. Meanwhile, random lasers have attracted attention as low-cost and easily fabricated optical devices without a clear cavity structure. However, random lasers have issues such as laser oscillation at multiple wavelengths, low S/N ratio of the laser oscillation peak, and high oscillation threshold value, etc., because of the randomness of their structures. AIST developed the laser-induced melting method that can obtain submicrometer-sized spherical particles of crystalline metals or oxides by irradiating relatively weak pulse laser light at raw material particles dispersed in a liquid (a research result of AIST announced on September 1, 2010). Such particles were never before obtained by conventional chemical methods. This method was used to produce submicrometer-sized spherical particles of titanium oxide, and the potential for using the particles as light-scatterers to effectively utilize light in wet solar cells was demonstrated (a research result of AIST announced on January 30, 2012). Through collaborative research with Hokkaido University, Kyushu University, and Kagawa University, AIST pursued material design for improving the performance of random lasers. By developing previous research, Associate Professor Hideki Fujiwara of Hokkaido University has numerically validated the fact that an aggregate of light-scatterers having a uniform size and shape exhibits very small transmittance at a specific wavelength region and works as a type of mirror. Furthermore, he has numerically demonstrated that if a point defect is introduced into the aggregate of these light-scatterers, light of the specific wavelength region is spatially confined. The point defect size larger than the size of the light-scatterers and the absence of incidental interspaces that function similarly to the defect are important. The present research has been conducted aiming at the experimental verification of these numerical demonstrations. Figure 2: (left) Fluorescence image of a polymer particle (arrow) introduced as a defect and (right) lasing intensity distribution in the same region of the fluorescence image. Arrow 1 indicates the position of the polymer particle introduced as a defect, and arrow 2 indicates the position of a submicrometer-sized ZnO spherical particle film (defect-free site). In order to demonstrate the effectiveness of the proposed method, ZnO was selected as light-scatterers and gain medium, since there were already many reports of random laser oscillation using ZnO, and submicrometer-sized ZnO spherical particles with a particle diameter suited to the resonance wavelength were used. When the researchers evaluated the optimal size of single ZnO spherical particles, which would work as a mirror or filter at the emission wavelength of ZnO (380-390 nm), they found that about 200-nm ZnO spherical particles must be used in their experiments. Thus, ZnO particles having a mean diameter of this size were produced from commercially available ZnO particles by using the laser-induced melting method that AIST developed. Irregularly shaped ZnO particles (mean diameter: 100 nm) dispersed in water are irradiated by non-focused pulsed laser light (wavelength: 355 nm; pulse width: 6 ns; repetition frequency: 10 Hz) to create submicrometer-sized spherical ZnO particles. Figure 1 (left) shows an electron micrograph of the obtained ZnO particles with a mean diameter of approximately 212 nm. Then, green fluorescent polystyrene particles (polymer particles; mean diameter: 900 nm) are intentionally added as defect particles to the solution in which the spherical ZnO particles were dispersed, and then the solution is dripped onto a glass substrate and dried to produce a film with an approximate thickness of 100 μm. 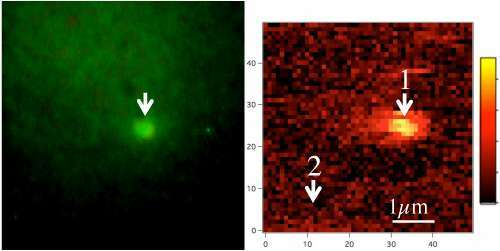 The location of the defect particles can be identified by the green fluorescence image, as shown in Fig. 2 (left). Figure 3: (left) Emission spectra measured at a defect-free site (arrow 2 in Fig. 2). (right) Emission Spectra at a defect within a film prepared using polymer particles and ZnO particles before the laser-induced melting. To evaluate the laser oscillation properties of this film, the pulsed laser light (wavelength: 355 nm; pulse wavelength: 100 ps; repetition frequency: 1 kHz) was irradiated (spot size: approximately 65 μm) onto the film as excitation light by using an objective lens. The emission from ZnO particles were collected by the same objective lens, passed through a pinhole (equivalent to approximately 1 μm at the sample surface), and then introduced into the detector by an optical fiber. Figure 2 (right) shows the emission intensity distribution of a ZnO spherical particle film when the intensity of the excitation light was kept constant (10 MW/cm2). An intense bright spot is observed in the intensity distribution and the spot position was almost the same as that of the fluorescent particle in Fig. 2 (left). Note that the fluorescence from the polymer particle is believed to hardly affect the results, because it is very weak and easily degraded by the irradiation of the excitation light. Figure 1 (right) shows the emission spectra measured at the polymer particle (arrow 1 in Fig. 2 (right)) with the excitation intensities of 0.5, 1.0, and 2.0 times the threshold. A single sharp emission peak was observed at a wavelength of approximately 380 nm. Even when the intensity of the excitation light was increased to five times the threshold value, neither variation in the wavelength of the emission peak nor any other peaks were confirmed. In addition, spectral narrowing and increase in the background fluorescence peak, which are typically seen in conventional random lasers, were not observed. Meanwhile, from the spectrum (Fig. 3 (left)) that was obtained at a location (arrow 2 in Fig. 2 (right)) distant from the defect, a narrowed fluorescence peak at about 388 nm and multiple sharp emission peaks near the fluorescence peak wavelength were observed. In addition, the intensities of the sharp peaks were unstable and varied with each excitation energy and excitation pulse. These behaviors were observed at other locations distant from the defect position, similar to the behavior of conventional random lasers, and differed thoroughly from the behavior (Fig. 1 (right)) of the random lasing at the defect. In addition, as a reference sample, the researchers also made a similar film using polymer particles and ZnO particles before the laser-induced melting whose sizes and shapes are not uniform. From the defect location of the film, multiple sharp peaks were observed at around 388 nm, as shown in Fig. 3 (right), which was also very similar to the behaviors of conventional random lasers. This demonstrates that the production of submicrometer-sized ZnO spherical particles by the laser-induced melting method plays an important role for achieving superior random lasing properties. Figure 4 compares the excitation intensity dependence of the intensity of the laser peak at the defect (left) and at a defect-free site (right). The arrows indicate the threshold, which is defined as the excitation intensity where the sharp peak initially appears in the emission spectrum. Since the intensity of the sharp emission peak increases non-linearly when the excitation intensity exceeds the threshold, random laser oscillation had occurred regardless of the existence of defects. However, because the threshold at the defect (Fig. 4 (left)) is approximately 6 MW/cm2, which is approximately 13 times smaller than the threshold at the defect-free site (about 80 MW/cm2) (Fig. 4 (right)), the researchers confirmed that the laser oscillation can be easily induced at the defect. Figure 4: Excitation intensity dependences of the intensities of the emission peaks at the defect (left) and at the defect-free site (right). The arrows indicate the thresholds. In addition, the spatial extent of the random laser oscillation at the defect was estimated to be approximately 1300 nm, which was derived from the distance dependence from the defect center of the height of the laser oscillation peak, and the laser oscillation mode was spatially well confined to the area surrounding the defect. Thus, by simply introducing polymer particles to the thin film of uniform, submicrometer-sized ZnO spherical particles fabricated by the laser-induced melting method, the researchers was able to improve unique random lasing properties such as limiting the lasing position at the defect, suppressing the number of lasing modes, controlling the wavelength of lasing, and lowering the thresholds. 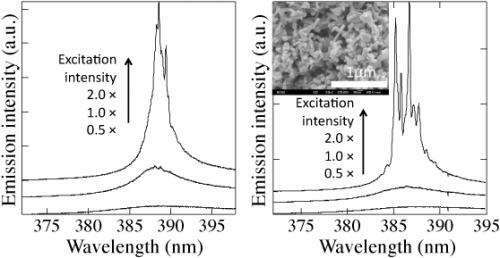 In the developed method, the researchers can realize random laser element with superior lasing properties simply by coating a substrate with the solution containing polymer particles and submicrometer-sized spherical particles. Therefore, a small and inexpensive laser element can be easily manufactured, and a variety of applications that are required to be inexpensive and to have monochromatic properties can be expected: small light sources, spectroscopic devices for household health monitors, materials for illumination, and electric devices containing light-emitting elements, etc. The researchers are aiming to improve the particle size homogeneity and to search for materials to develop new random lasers with different lasing wavelengths.